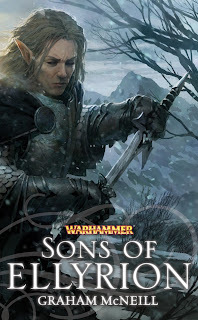 Lord of the Night reviews the epic High Elves duology, Defenders of Ulthuan and the long-awaited sequel Sons of Ellyrion by Graham McNeill, New York Times Best Selling Author and winner of the 2010 David Gemmell Legend Award. Its been a bit since my last review, mainly because i’ve been delving into books that I didn’t feel the need to review, though mayhaps in the future you’ll see an Honor Harrington series review or more for A Song of Ice and Fire but now we are back to Warhammer Fantasy. This was my first real outing with the High Elves, i’m solidly in Malekith’s camp and with Naggaroth, but the heroes of Ulthuan are a delight to read. This has definitely made me an all-round Elf fan, but i’m still rooting for Malekith. When a lone elf washes up on the shores of Ulthuan with no memories, save only that he must find Teclis the legendary Loremaster and impart some message, the elf Caelir begins a journey that will take him all across Ulthuan, to places born of creation and places lost to time itself. Meanwhile the morose elf Eldain and his wife Rhianna are called to Saphery, to start their own journey that will see them fight dark legends, discover horrific truths and meet some of the greatest heroes ever to live. And while the battle rages the stories of great champions, known and unknown continue on. At the gates of Lothern the legendary Prince Tyrion leads the defence against the Witch-King’s hordes, at the Eagle Gate the brave defenders face the Hag Sorceress and the champions of the Prince of Pleasure, and the forest realm of Avelorn faces its darkest hour as the darkness of the Druchii pervades its lands. The characters of these two novels are fantastic, both the new and the old. New for the novels we have Caelir the amnesic Elf who holds a dark secret locked in his mind. Eldain the lord of Ellyr-Charoi who too holds a dark secret, but far wider in its scope. And Rhianna, wife of Eldain and a mage of Saphery who serves as Eldain’s last real connection to the world. And the fearsome Chaos Champion Issyk Kul, a perverse killer that shows us the plans of the enemy, and the predations of Slaanesh (or Shornaal as he is known to Kul). Plenty of famous characters play pivotal roles in the novels. Chief of these is Prince Tyrion, descendant of Aenarion and the champion of the Phoenix King and the Everqueen, who leads the defence of Lothern and through whom we finally get to see a bit of the curse left by Aenarion to be suffered by his descendents. But many others do appear such as Eltharion the Grim, the Phoenix King Finubar and the Everqueen Astarielle, Prince Imrik of Caledor and of course, Malekith the Witch-King and his infernal mother Morathi. These characters all lend weight to the story, provide interesting viewpoints and some truly epic moments. The action in the two novels is breathtaking. The bravery and heroism of the Asur, the relentless cruelty of the Druchii, the madness and perversion of the Slaaneshi warriors all clash together in a land of magic and wonders, both good and bad. The personal duels and battles are quite good, but its when magic comes into play that the battles take on a whole new dimension. My personal favourites are Issyk Kul’s final battle, the end of the Battle of Lothern, the arrival of Avelorn’s army and the final battle for Caelir, Eldain and Rhianna (and the other Elf present who I won’t name). The world of Ulthuan has also been fleshed out as Naggaroth was in Malus Darkblade. The grim marches of Tor Yvresse, still wounded from the Goblin King’s rage. The straits of Lothern, clean and filled with the scent of the sea. The wild forests of Avelorn unbound by limits and rife with the power of creation. The plains of Ellyrion, wild and untamed where elf and horse ride as one. McNeill has brought a new life to Ulthuan, giving us descriptions and visits to places that before were just names and lists of past heroic deeds. The pacing of the series is very good. The books never dragged on, nor did they grow stale. The battles are fantastic but the peaceful scenes, of travel and discovery and character development are just as engrossing. The air of suspense that hangs over which characters will live or die is palpable, some characters will obviously live to fight another day but enough new characters live and die that you never quite know who is safe and who isn’t. The ending of the first novel is a hell of a cliffhanger, i’m glad I didn’t get Defenders of Ulthuan when it first came out because that cliffhanger would have been gnawing at me for years. But for Sons of Ellyrion the ending is far larger. It could be debated that its a happy ending or a sad one, some live some die, but I think of it as a happy ending for the protagonists, its not a storybook ending but its filled with sacrifice and love, and at the very end, hope for the future. 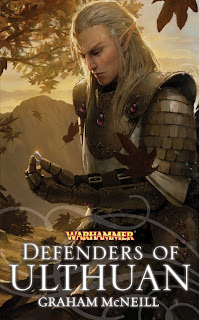 I give both Defenders of Ulthuan and Sons of Ellyrion a 10/10, these two are a must-read series if you have ever read a Warhammer novel, or even expressed interest in the High Elves. These are the novels that will get you hooked on the fantasy world. Should you buy these novels? The answer is yes to all. Any fan of Warhammer, Elves or just fantasy these are two novels that you should read. This is epic fantasy and shows us why Graham McNeill won the Legend Award, which I hope he wins again for Sons of Ellyrion. Well that’s it for this review. Most likely next will be Path of the Seer, or possibly Thanquol’s Doom if my reviewer post for Black Library is accepted. I strongly hope its the latter, being a devotee of the Horned Rat like Thanquol I am eager to see his next adventure.